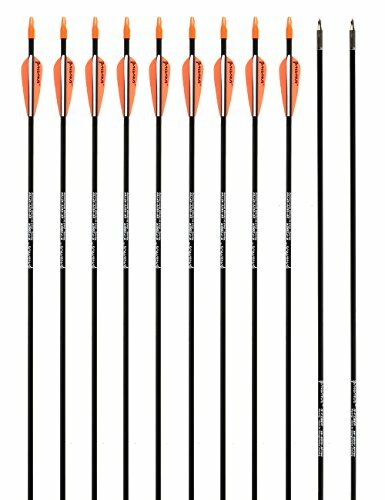 28-inch Fiberglass Hunting / Target Practice Arrows with Field Points High quality target practice arrows for all bows. Draw Weight: Up To 45Pounds - Traditional & Recurve Bow Only User Notice Do not shot against concrete wall or any hard substance. This may damage the arrows. If the fletching have a little bent,you can straighten them by using an air dryer or soaked in hot water. 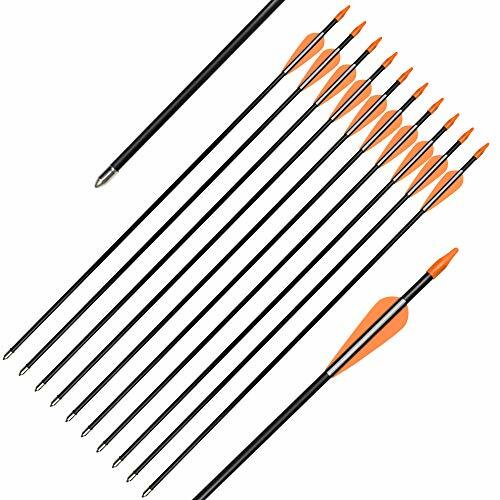 Outer Dia :6mm Iner Dia :4mm Flething length:3" Material:Fiberglass Arrows body Length: 30" Full Length:31.5" Spine: 1200 Feather Material: Plastic Weight:29g The tips can not be replaceable . Condition: New item package include:12 pcs User Notice Do not shot against concrete wall or any hard substance. This may damage the arrows. If the fletching have a little bent,you can straighten them by using an air dryer or soaked in hot water. Specification: Material: compression molded firbreglas Bow length : 43" Bare bow weight : 1.15 Lb Draw weight : 14-16.5lb Brace height : 8.6" Draw length : 26" String length : 43" The Youth bow is the perfect first bow for younger kids ready to join the sport. Great for learning valuable shooting skills while having fun! 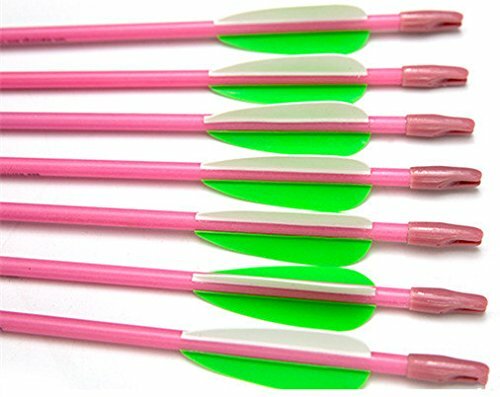 Product feature: Shaft Material: Fiberglass Arrows body length: 30 inch Arrow shaft size: 0.275" (I.D. ), 0.236" (O.D.) Suitable for: Compound and Recurve Bow Target. 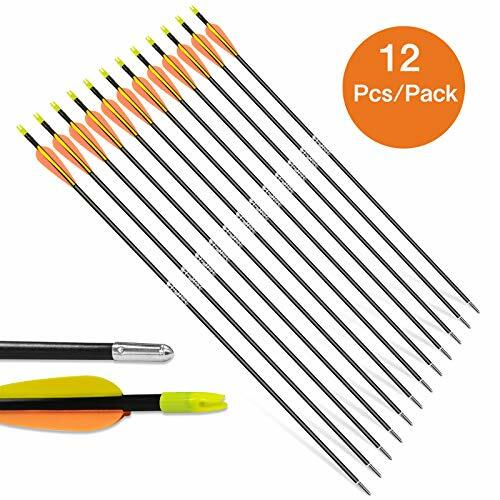 Package includes :12 pieces of Fiberglass Arrows Archery. 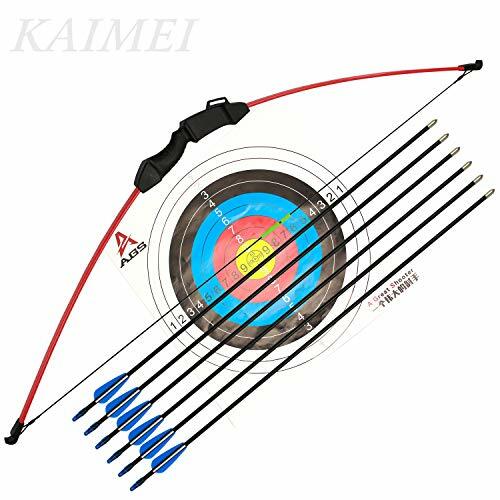 User Notice Also, it is widely used in Recurve bow, Children's bow, composite bow and slingshot in archery hall, entertainment place, school, family , parent-child entertainment and other places. Archery is a very professional sport. You must choose the right arrow to shoot according to the bow you use. A mismatched bow and arrow may damage your bow and your safety during shooting. Attention must be paid! 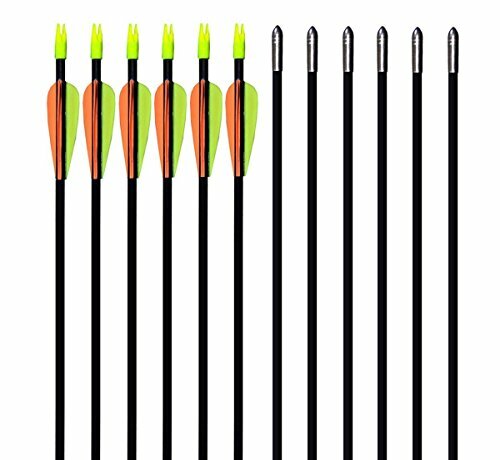 Archery Hunting and Targeting 32inch fiberglass archery arrows for bower 12pcs in the package 2Yellow1Orange vanes and balck shaft Material:Fiberglass 3"vanes,100grain tips Fiberglass arrow shaft diameter:7.8~7.9mm 100Grain stainless steel field points Plastic Nocks are not fixed by glue,they can be adjusted for your bow Great Archery 32inch Fiberglass Arrows for Hunting or targeting. We also sell bows and other outdoor sports items, please contact us freely if you have any needs. 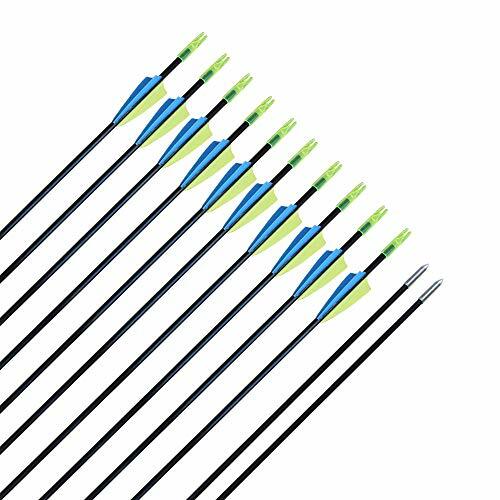 CQ Archery provide the strong & reliable structure products for your archery career! 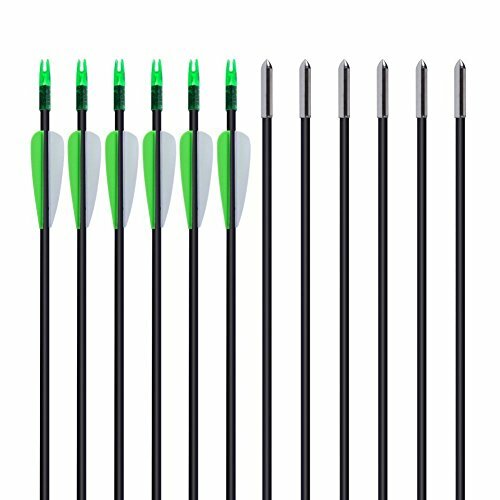 Our recurve bow arrows are good target and practice arrows, fit for youth and beginners as a gift. 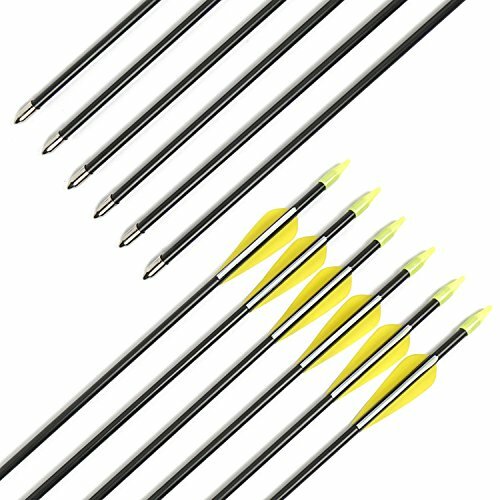 Arrows Specification: Shaft material: Fiberglass; Length:28", OD: 6.75mm, total weight: about 35.8g, vanes: 2.5" 2 blue 1 yellow; Length:30", OD: 6mm, total weight: about 31.2g, vanes: 2.5" 2 blue 1 yellow; Nock/Point: glued-on; Fit for recurve bow, up to 25lbs; Package:1 dozen; User Notice 1.Warning：Check for damage before each shooting. 2.Do not shot against concrete wall or any hard substance. This may damage the arrows. 3.The vanes may be bent because of long way transportation, but it can recover by using an air dryer or soaked in hot water for a while. 4.The use of an overdraw significantly increases the risk of injury to the shooter. 5.Keep novice archer constantly supervised. 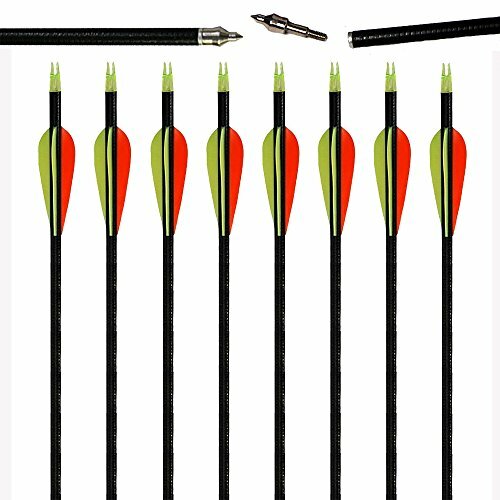 Compare prices on Arrow Fiberglass Archery Target at LiveSaler.com – use promo codes and coupons for best offers and deals. We work hard to get you amazing deals and collect all avail hot offers online and represent it in one place for the customers. Now our visitors can leverage benefits of big brands and heavy discounts available for that day and for famous brands. We try to makes comparison shopping easy with Product Reviews, Merchant Ratings, Deal Alerts & Coupons. Find Deals, Compare Prices, Read Reviews & Save Money.